Product #55733 | SKU TL-DECOM5-3P | 0.0 (no ratings yet) Thanks for your rating! As the world becomes more connected, being able to access WiFi anywhere in your house, reliably and with the strength you require becomes more and more important. The standard WiFi router is strong, and connects well with devices, however the signal degrades with distance, especially with obstacles like walls in the way. 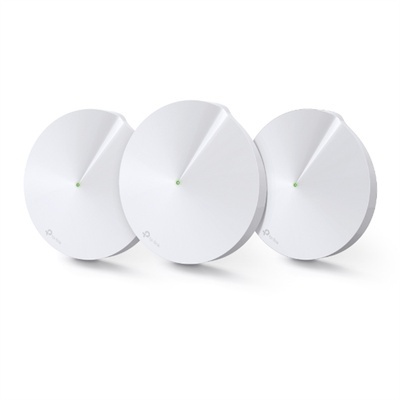 The standard way to work with this is through WiFi Extenders, however these create overlapping zones, where a device can be unsure of which zone to connect to, and wireless extenders are normally less powerful than a standard router. Mesh Networks are designed to work with your modern environment. With centralised control, and smart adaptive network connection, they create a seamless whole home network controlled from a single point. Easily expandable (simply increase the number of mesh units in your home), this means not only can your entire house have coverage, but your devices will always have the strongest connection possible, without drops between networks, or speed loss due to differences in routers. Deco Mesh networks also come with TP-Link HomeCare. This system gives you three years of network protection powered by TrendMicro. With a three step process (Blocking Malicious threats, Learns to stop attacking traffic and Isolating infected devices) HomeCare protects your network, and all those connected to it. It also provides controls so you can set parental controls for different devices, pause the internet and set time limits for certain devices as well.